As part of the preparation work for the provincial championships the Tigers enlisted the services of the Oliver-based, Big League Experience team last weekend. That included the likes of World Series winning pitcher Albert Anthony “Albie” Lopez and Milwaukee Brewers scout Marty Lehn who operates the Oliver-based Big League baseball camps. 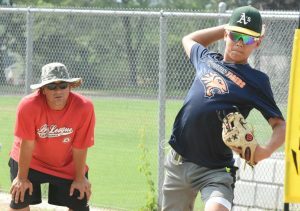 “Awesome, unbelievable, we couldn’t have asked for any better preparation going into the provincial tournament,” said MacIntyre, whose club finished in second place in the 21-team B.C. Baseball league regular season standings. “Those two (Lopez and Lehn) are first class guys, know their stuff and are just really good at getting their message across. For his part, Lopez, who was a member of the 2001 World Series Championship Arizona Diamondbacks, is still living his dream. “It’s just giving back to the kids, watching the kids’ eyes as they look at me. Their eyes are wide open and any kind of information I can give them, they’re just so happy to get. As usual, one of the highlights of his visit to any young team is taking out the little cloth pouch from his duffle bag that contains the 14 karat, diamond studded, World Championship ring. “Oh man that’s the ultimate prize, it gives them something to shoot for, they love it,” said Lopez.